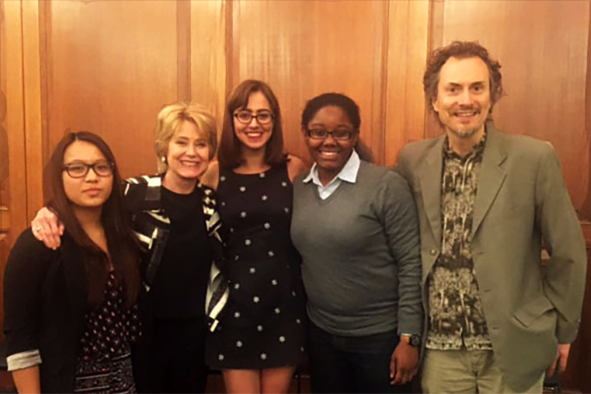 After a session facilitated by CMC majors, journalist Jane Pauley gave the department a double shout out in her public address. CMC Celebrates 10 Years with Global Peace Film Festival. Students in Denise Cummings’ “Global Peace Film Festival: 10 Years at Rollins” community engagement course help produce the milestone festival. Rollins Action Network. Drs. Lisa Tillmann and Kathryn Norsworthy launch the Rollins Action Network, a group of faculty (and later staff as well) committed to community organizing and social change. A CMC Sentinel. Dr. Lisa Tillmann publishes an op-ed in the Orlando Sentinel supporting marriage equality. Film Shines Light on Weight Bias. CMC announces the completion of Dr. Lisa Tillmann’s 3rd documentary, Weight Problem: Cultural Narratives of Fat and "Obesity." The film centers on the testimony and creative work of students enrolled in Dr. Tillmann’s CMC 320: Political Economy of Body and Food. According to a website for the film, “Weight Problem addresses stereotypes that circulate in our homes, with our peers, at primary and secondary schools, on college campuses, in the dating arena, and in mass media. The film directly challenges the rhetoric of the ‘obesity epidemic,’ which serves the $50-60 billion-per-year Diet Industrial Complex more than it improves public health.” Weight Problem goes on to screen at the 2014 Global Peace Film Festival, and panels are devoted to it at the International Congress of Qualitative Inquiry and the meetings of the National Communication Association. Activist Chronicles. Routledge publishes Dr. Lisa Tillmann’s second book, In Solidarity: Friendship, Family, and Activism Beyond Gay and Straight. A committee of scholars affiliated with the International Congress of Qualitative Inquiry awards In Solidarity the 2015 H.L. (Bud) Goodall and Nick Trujillo “Way of Life” award for Best Book. Read The Independent spotlight here. Outstanding! In September 2014, Dr. Lisa Tillmann is inducted into the Lake City, Minnesota (her hometown) Hall of Fame under the category of Outstanding Life’s Work. The Family Expands. In August 2014, CMC welcomes Drs. Steven (Steve) Schoen, Assistant Professor of CMC, and Stacey Coffman-Rosen, adjunct faculty in CMC. CMCs “Burns Effect.” Famed documentarian, Ken Burns, Winter Park Institute’s final guest speaker in spring 2014, shares the stage with seniors Somar “Suki” Lanh, Daniel Udell, and McKenzi Vanderberg during a special session for all Rollins students. CMC Debuts at Florida Film Festival. CMC major McKenzi Vanderberg’s short film The Fear of Being Uninteresting screens at the Florida Film Festival. Moving Off the Menu. What’s wrong with the ways we relate to our bodies, to others’ bodies, to eating and to food—and what can we do about it? This question drives Dr. Lisa Tillmann’s 2nd documentary: Off the Menu: Challenging the Politics and Economics of Body and Food. The film goes on to screen at the 2013 Global Peace Film Festival; to have panels devoted to it at the International Congress of Qualitative Inquiry and the meetings of the National Communication Association; to be named co-winner of the 2014 H.L. (Bud) Goodall and Nick Trujillo "Way of Life" award; and to win the 2014 National Communication Association Ethnography Division’s Best Audio/Visual Ethnography. CMC Stands For Equality. CMC major Annie Koeblitz’s capstone documentary Becoming an Ally screens at the 2013 Global Peace Film Festival. CMC and Oliver Stone. Winter Park Institute Guest Speaker, Director Oliver Stone, is hosted and interviewed by CMC majors Kevin Crosby, McKenzi Vanderberg, and Cass Yankala and Film Studies minors Anthony Composto and Somar “Suki” Lanh. Critically Reading Film. CMC proudly announces the publication of Dr. Denise Cummings’ co-edited book, Seeing Red—Hollywood’s Pixilated Skins: American Indians and Film (Michigan State University Press). Seeing Red is an anthology of critical reviews by leading scholars in American Indian Studies. Remembering Premieres. Dr. Lisa Tillmann completes her first documentary film project, Remembering a Cool September (about LGBT civil rights). Co-produced with David Dietz, Remembering goes on to screen at the 2012 Global Peace Film Festival and to win the 2013 National Communication Association Ethnography Division’s Best Audio/Visual Ethnography. CMC at Global Peace. CMC major Clementine Leger’s The Necklace, a narrative short about hunger, screens at the 2012 Global Peace Film Festival. CMC Interviews Indigenous Filmmakers. Erin Wareham (2012) films interviews with Indigenous filmmakers for her CMC senior capstone film at the 2011 Native American Literature Symposium at the tribal venue, Pueblo of Isleta, Albuquerque, NM, in March, 2012. Accompanying Erin at the conference is her CMC 400 Professor, Dr. Denise Cummings. Visualizing Native American Film and Art. CMC announces the publication of Dr. Denise Cummings’ first book, the edited collection Visualities: Perspectives on Contemporary American Indian Film and Art (Michigan State University Press). Domestic Partner Registries Secured in Orlando and Orange County. The Orlando Anti-Discrimination Ordinance Committee, whose members include Dr. Lisa Tillmann, meet with commissioners and give public testimony in support. The registries help ensure that life partners have access to one another in critical life situations such as hospitalization. Bon Voyage! Critical Media and Cultural Studies bids farewell to Provost Roger N. Casey, wishing him well in his next adventure: President of McDaniel College. Dr. Casey participated actively in the development of the CMC curriculum, including the foundational version of CMC 300: Critical Frameworks, which he taught even while serving as dean and provost. CMC and Orange County Policy. After years of public pressure, the Orange County Board of Commissioners votes to add sexual orientation/gender identity to the classes protected by its nondiscrimination ordinance. One group applying that pressure was the Orlando Anti-Discrimination Ordinance Committee, whose members include Dr. Lisa Tillmann. CMC Major Contributes to Global Peace. Sam Barns’ capstone documentary Illegal Dreams, on the human rights of undocumented persons, screens at the 2010 Global Peace Film Festival. CMC Presents Scholarship. Sydney Sullivan (2010) and her CMC 350 Native American Media and Cultural Studies Professor, Dr. Denise Cummings, represent Rollins at the Native AmericanLiterature Symposium at the tribal venue, Pueblo of Isleta, Alburquerque, NM, in March 2010. Sydney becomes the first CMC major to present research at an international conference. CMC on the Red Carpet. Four CMC students--Rachel Albergo, Adrian Cohn, Margaret DeWees, and Whitney Wallingford--represent Rollins at the Cannes Film Festival. Their film, This Is My Rollins College T-shirt, about where Rollins-branded goods are made and under what conditions, screens at the Short Film Corner. Accompanying the students is their CMC 100 Professor Dr. Lisa Tillmann. CMC Helps Expand Equal Opportunity. A successful campaign spearheaded by Dr. Lisa Tillmann and the Finance and Services Committee and Dr. Kathryn Norsworthy of the Diversity Committee culminates in the addition of “gender identity and expression” to Rollins College’s Equal Opportunity Policy. CMC Serves Ethnography. Vice Chair Elect Lisa Tillmann begins a 4-year term of service to the Ethnography Division of the National Communication Association. She will chair the division in 2011-12. CMC Majors Make Music. Writer/singer Maia Ryan and director/editor Adrian Cohn collaborate on “Ideologies: The American Dream Song.” The music video screens at the 2009 Global Peace Film Festival. Artist and Scholar. Dr. Theodore (Ted) Gournelos (MFA, Sculpture; PhD, Communication) joins the department, becoming CMC’s third tenured/tenure-track faculty member. Dr. Gournelos goes on to teach for 3 years in CMC before relocating to the department of Communication. Pomp and Circumstance. In May 2009, CMC graduates our first class. Guiding Independent Cinema. After years of service to Florida Film Festival, Denise Cummings is invited to formally serve as the Rollins representative on the Advisory Council for Enzian Theater and the Florida Film Festival. CMC Majors Intern, Travel, and Serve. Denise Cummings becomes the department’s practicum coordinator for CMC International/Study Abroad, Internships, and Service to Campus Media. CMC and Global Peace. This Is My Rollins College T-shirt becomes the first CMC production to screen at the Global Peace Film Festival. Congratulations to CMC alums and majors Rachel Albergo, Adrian Cohn, Margaret DeWees, and Whitney Wallingford. CMC Excels on Local TV. Denise Cummings, with Julian Chambliss, History, wins a 2008 National Bronze Telly Award for co-writing, producing, and starring in, “The Colony Theater,” for Orange TVs Scrapbook, Episode 2 (Dir. : Ericka Cotton). Orlando, FL, 2008. CMC and DC. In August 2008, Visiting Assistant Professor of English Denise Cummings becomes an Assistant Professor of Critical Media and Cultural Studies. Liftoff! After a 5-year campaign led by Dr. Lisa Tillmann, Critical Media and Cultural Studies launches at Rollins. Dr. Denise Cummings also devoted years of service to the curriculum development committee convened by then-Dean Roger N. Casey.